Education for Life: A European Strategy critiques the educational system in European countries and offers suggestions for its improvement as well as solutions for its problems. The book is divided into six parts. Part I deals with topics such as the revitalization of education; the cooperation of industry and education; and the training of some companies. Part II is concerned with the present trends, major issues, the thrust of positive action, and industry involvement in the education of the youth. Part III talks about the higher education in Europe, its comparison with other educational systems, and proposals of action for its problems. Part IV covers vocational education; the new technologies and occupations it offers; and the businesses involved in training and education. Part V tackles management education; management development practices; and the European management model, while Part VI discusses lifelong learning and adult education; the restructuring of industry and work; open learning; and the obstacles to progress in adult education. 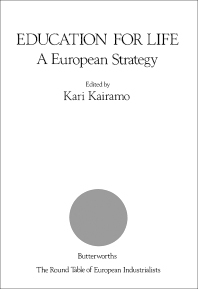 The text is recommended for those in the education department, especially those in European countries, who are making studies on education and the approaches to its problems. 3. How is Industry Responding to the Changes?